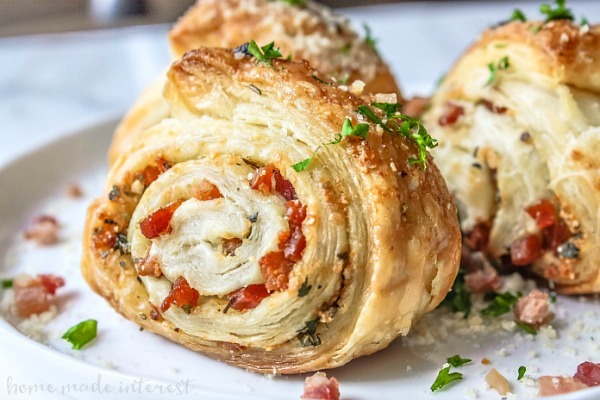 Parmesan Puff Pastry Pinwheels - Home. Made. Interest. 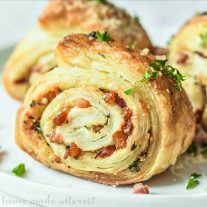 These Parmesan Puff Pastry Pinwheels are an easy appetizer recipe of light and fluffy puff pastry filled with Parmesan, pancetta, and parsley! I love the holidays because I have an excuse to make all of my favorite appetizers! I’ve got lots of parties lined up over the next few weeks and whether I’m hosting or attending a party easy appetizer recipes that taste great are always appreciated. I’m not even going to pretend that I can pick a favorite. Last year I made my easy antipasto skewers, and mini lasagna rolls several times and everyone loved them. This year I am all about pinwheels and puff pastry. There is something amazing about light, flaky, buttery puff pastry. Wrap it around just about any ingredients from sweet to savory and you’re sure to have a winning recipe. I went with savory for this easy pinwheel recipe and OMG, did it turn out good. These little guys flew off of the platter and I had requests for more :). They start with store-bought puff pastry, but of course you’re welcome to make your own if you have a favorite recipe, brushed with a mixture of olive oil, Parmesan cheese, and parsley, then sprinkled with cooked pancetta. If you haven’t heard of pancetta before it is basically an Italian bacon. If you can’t find pancetta in your grocery store you can substitute it with bacon and it will be just as good! All of those tasty ingredients are rolled up in the dough and then the puff pastry is cut into shorter pieces. All of the pinwheels are placed on a baking sheet and baked for 35 – 40 minutes or until the dough in the center of the spiral is completely cooked. What you end up with this is simple, beautiful, delicious appetizer that is perfect for the holidays. 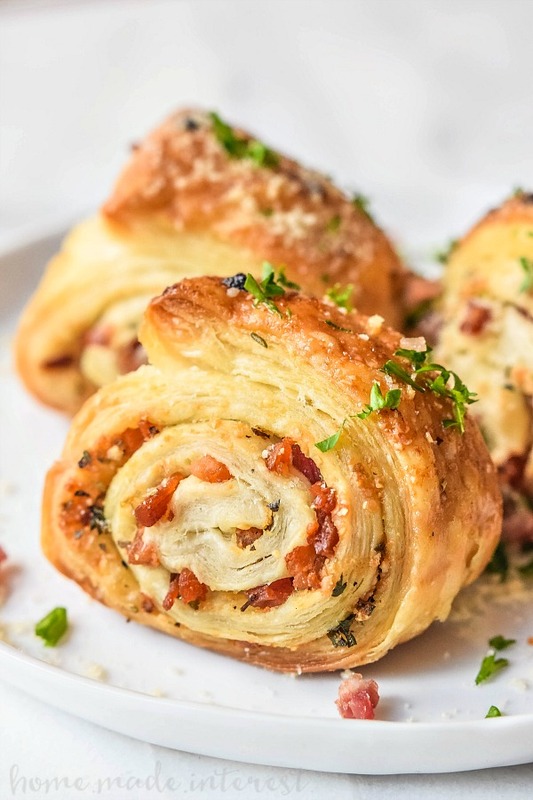 These Parmesan Puff Pastry Pinwheels are light, fluffy, and full of flavor. If you are using frozen puff pastry remove a sheet from the freezer and let it sit out for 15 - 20 minutes. In a bowl combine the olive oil, Parmesan cheese, garlic powder, parsley, salt, and pepper. Take your puff pastry sheet and roll it out slightly. This is just to flatten it a little so 2 passes of the rolling pin should be plenty. Spread the Parmesan mixture over the puff pastry leaving a little in the bowl to brush the top with later. Sprinkle the cooked pancetta over the puff pastry. Gently roll the puff pastry up starting on a long side to create a long roll. Cut the roll into pieces about 2 inches thick. Place the rolls on a parchment paper lined baking sheet and brush the tops of each roll with the last of the Parmesan mixture. Bake for 35-40 minutes or until the puff pastry looks fully cooked in the middle of the pinwheel spiral. Note: After the first 20 minutes check the pinwheels often to make sure that they aren't overcooking on the bottoms.